“Civil servants have suppressed warnings that wind turbines can generate noise damaging people’s health for several square miles around. The guidance from consultants indicated that the sound level permitted from spinning blades and gearboxes had been set so high—43 decibels—that local people could be disturbed whenever the wind blew hard. 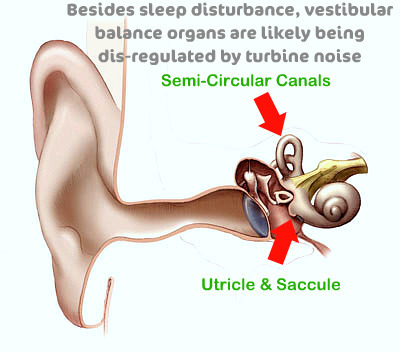 The noise was also thought likely to disrupt sleep. “The report said the best way to protect locals was to cut the maximum permitted noise to 38 decibels, or 33 decibels if the machines created discernible ‘beating’ noises as they spun. Editor’s note: This image was added by WTS.com. “It has now emerged that officials removed the warnings from the draft report in 2006 by Hayes McKenzie Partnership (HMP), the consultants. The final version made no mention of them. It means that hundreds of turbines at wind farms in Britain have been allowed to generate much higher levels of noise, sparking protests from people living near them. The guidance from consultants indicated that the sound level permitted from spinning blades and gearboxes had been set so high—43 decibels—that local people could be disturbed whenever the wind blew hard. The noise was also thought likely to disrupt sleep. “Our problems started three days after the turbines went up and they’ve carried on ever since. It’s like having helicopters going over the top of you at times—on a bad night it’s like three or four helicopters circling around,” she said. It has also been used by ministers and officials to support the view that there was no need to revise official wind farm noise guidelines and that erecting turbines near homes posed no threat to people’s health and wellbeing. In their draft report the HMP researchers recommended that “consideration be given to a revision of the night-time absolute noise criterion,” noting that this would fit with World Health Organisation recommendations on sleep disturbance. The final report removed any suggestion of cutting the noise limits or adding any further penalty if turbines generated a beating noise—and recommended local authorities to stick to the 1996 guidelines. The following is a commentary on the released documents, by the Den Brook Judicial Review Group, the group that successfully procured these documents under Freedom of Information laws. This commentary can be read in full by clicking here. For the relevant emails and other documents “sprung” by Mr. Hulme from the government, visit National Wind Watch (click here) and scroll to the bottom of the page. WTS.com has excerpted the “Health Comment Removed” section, a matter we find especially alarming–Editor. Although the original purpose of the study was to examine the potential health effects of wind farm noise, the Information Commissioner’s report notes that it is not a statutory duty of DECC (or its predecessor departments, BERR and the DTI) to set noise policy or noise limits. This responsibility resides with DEFRA. However, DECC is charged with removing barriers to the expansion of wind farms in the UK and takes upon itself responsibility to ensure that the wind farm noise guidance known as ETSU-R-97 is up-to-date and robust. DECC [Ed Miliband’s Department of Energy and Climate Change] stated that HMP [Hayes McKenzie Partnership], an independent acoustics consultancy, albeit with no expertise in the area of public health, was commissioned to carry out the study into the potential health effects of wind farm noise because there were no DTI [Department of Trade & Industry] staff with relevant expertise to do this work. 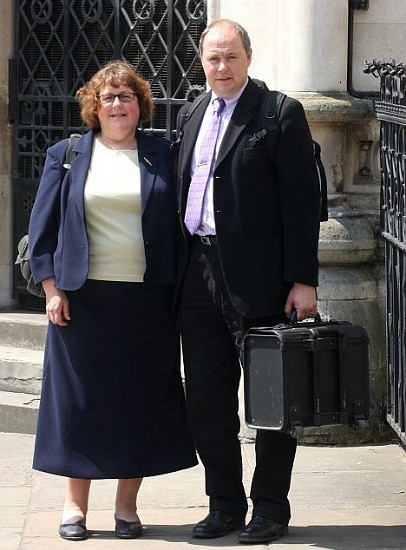 Mr. Hulme [the individual who successfully filed the lawsuit for the release of these documents], in arguing that the drafts should be released, quoted the then Minister for Energy in a House of Commons debate of 5 July 2007, in which he relied on the findings of the HMP report to support his statement that there is ‘no evidence of adverse health effects from wind turbines.’ Mr. Hulme argued that the public was entitled to know on what basis the Minister for Energy could make such a confident assertion. The Information Commissioner accepted Mr Hulme’s point and added that disclosure of the report drafts would increase public confidence if it was revealed a careful drafting and review process had occurred or, alternatively, if it was revealed that the drafts were not subjected to adequate scrutiny then it could be argued that it would be in the public interest to disclose the drafts in order to reveal these failures. A difficulty in returning to sleep will result in tiredness the next day and all the associated descriptions of ill-health which might be associated with a lack of sleep. This sentence is dangerous and could be read that wind farms cause ill-health, which is not the intention. We need the report to stick to the facts that LFN is below the guidelines, but that once woken by a car there may be problems getting back to sleep for those with sensitive hearing as result of the windfarm–something like that. This is a remarkable statement and demonstrates the conflict of the roles adopted within the DTI, and now DECC, of promoting wind farm development while also having responsibility for the wind farm noise guidance policy intended to protect local residents. Editor’s note: Who was this anonymous individual–this pseudo-scientist? Talk about junk science! In America this person would be tarred and feathered.